Thanksgiving is almost here in the US, and this year falls on the 25th of November (55525), exactly one month before Christmas (55555). I was thinking about this a couple of nights ago, and was wondering when Hanukkah was this year, when I noticed that there was a full moon in the sky above me. I remembered Jon Stewart singing on A Colbert Christmas a couple of years ago (54793) that the Festival of Lights also starts "On the 25th." ("Of December?" "Kislev." "Which is when, exactly?" "I will check.") Since the full moon falls on the 15th day of Jewish months, that means that the holiday must follow in ten days, which would be the night of 1 December (55531/2). We don't really celebrate, since there are no kids left, but I'll probably bring home some gelt. That's all three holidays falling on the 25th of some month. I just noticed while writing this that Christmas falls on Modified Julian Day 55555, which is another reason to celebrate, I guess. I think it's funny that some people get upset if they hear "Happy holidays" instead of "Merry Christmas", because Christmas is not the only holiday. We have not only Christmas, Thanksgiving and Hanukkah, but also New Year, which most people celebrate regardless of their religion. I suppose somebody must celebrate Kwanzaa, too. ("What would it be like without Kwanzaa? Like every year before 1966.") If we were to be really accurate, we should mention all of them, but that would take forever, so why not just lump them under "holidays"? It's not meant necessarily to avoid offending non-Christians, and I don't why people want to do that, but it's to include the other holidays we all celebrate in this country, i.e. Thanksgiving early in the season, and the New Year later. 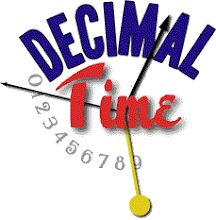 Decimal Clock is a simple app which displays an analog decimal clock, with the decimal time in digital underneath, on a green background with diagonal stripes. There are no other options or features. There is a 10 at the top of the clock, as with French clocks, but the digital display starts at 00.00.00, except a brief moment when it says 10.00.00. The app costs $0.99. There's an ad that's one of those autogenerated videos like that GEICO commercial at www.headoverflow.com. I've been using the Skyfire app for a few days now, and it seems to be working normally. It is still not ideal. The app is blocked on some sites, like Hulu and Fox, although I don't know why you would be able to watch Family Guy episodes on a computer but not on other devices. Some videos just don't load for some reason. However, the most annoying thing is pages that have multiple videos, like on io9, where Skyfire only plays the first video. It also don't work with Flash games and other animation, but fortunately Frash will work with some of them, if you're jailbroken. So still not perfect, but better than before. One of the biggest drawbacks with the iPhone has always been its lack of ability to run Flash. Flash is used to embed animation and video into web sites, and many sites use it, which means that a lot of web content is not available on iOS devices. Apple refuses to support Flash because it uses a lot of resources and degrades performance. This is true; I often have difficulty playing Flash videos on my old laptop. Apple has been promoting HTML5 for playing videos, and many sites now support this, but many still do not. I am frequently frustrated by this. Two months ago (55440.685) Skyfire announced that they had submitted an app to the iTunes App Store which would allow viewing of Flash video on web pages. The way it works is that they convert the Flash on their own servers and send it back to your device. That way, you don't have to run Flash on your iPhone, but you still get the videos. I have been eagerly waiting for the past two months for this app to get approved. Skyfire is already one of the most popular apps on Android and other phones. Apparently iPhones are not the only phones that have trouble with Flash. Well, today (55503) it happened. I bought the app for $2.99 and started browsing. First I tried one of their suggested sites, the Daily Show with Jon Stewart (even though I already watch it everyday on TV). It wouldn't load. Then I started browsing my news feeds, and quickly found a BBC story that had a Flash video. It took forever to load, then I got a few seconds of an advert and it stopped. Other attempts were also unsuccessful. I began to suspect what the cause of the problem might be, as it happens frequently when highly desirable sites turn on or get publicized. The servers are overloaded. Turns out, I was exactly right. Skyfire has removed their app from the App Store. They state that within five hours the app had become the top grossing iPhone app and that demand far exceeded their predictions. So now we have to wait for them to increase their capacity, which will probably take a while. At least this time I managed to grab the app before it was pulled. Usually by the time I learn about an app too good to be true, Apple has already pulled it, like when that kid snuck in free tethering in his app. Hopefully as the early adopters finish playing with their new toy, the servers will start running again, in which case I am ready.